Although the photo and the name of Zarephath may not be familiar to most people (even people who are familiar with the Bible), the significance of the place will become evident to your listeners when you connect it with the biblical references to this place. In other words, it becomes a springboard to an important biblical story. This week's photo comes from Volume 8 of the revised and expanded edition of the Pictorial Library of Bible Lands, which focuses on Lebanon. 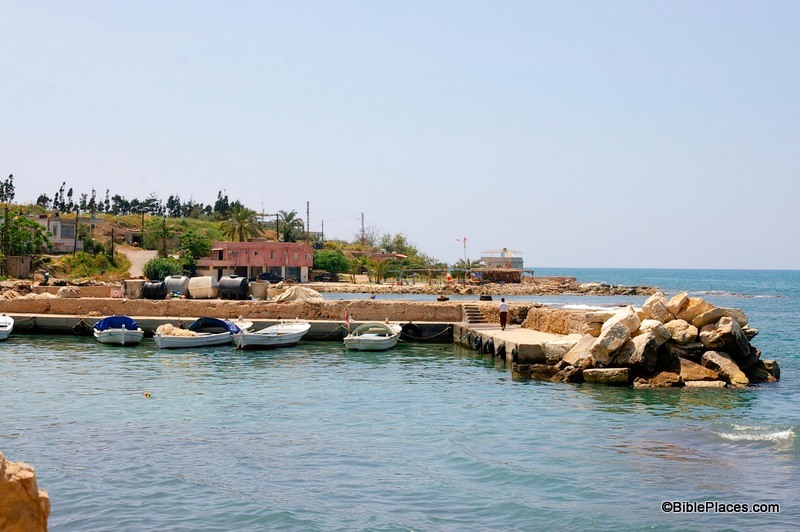 The photo is entitled "Zarephath, Phoenician Harbor and Tell from East" (photo ID #: adr090508617). Volume 8 is part of the "expanded" features of the PLBL. It is a completely new volume featuring the pictures of A.D. Riddle, a frequent contributor to this blog. So where is Zarephath and what is its biblical significance? Zarephath is an ancient city on the coast of Phoenicia, about 8 miles (13 km) south of Sidon and 14 miles (22 km) north of Tyre. In antiquity, it had a long and productive existence: it was inhabited from the Late Bronze Period (1600 BC) through the Byzantine Period (AD 600), so it was standing in both Old Testament and New Testament times. There is also a modern village about a mile from the site today. 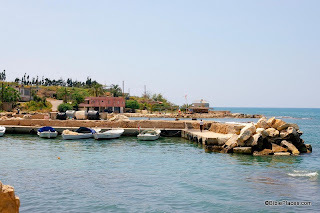 Naturally the name of the town changed over the years and as you moved from one culture to another: it was referred to as "Zarephath" by the Israelites, "Sarpu'uta" by the Egyptians, "Sariiptu" by the Assyrians, "Sarepta" by those in Hellenistic and Roman times, and "Sarafand" today. Zarephath occurs in two chapters in the Bible: 1 Kings 17 and Luke 4. In the book of 1 Kings, Zarephath is the town where the Lord instructed Elijah to go during the last part of the three-year of drought in Israel. While he was there, the Lord provided for Elijah, the widow, and her son in a miraculous fashion. This was followed by another miracle when the widow's son died and the prophet raised him back to life. This was a bold claim in the territory of Baal-worshippers: the God of the Israelites will perform a miracle on your behalf, not the god of the Sidonians. The widow herself seems to have already had faith in the God of Israel (1 Kgs. 17:12), but when 1 Kings 17 is studied in context with 1 Kings 18 the theme seems to be that God is mightier than the false god Baal. Finally, in Luke 4:24-26, Jesus references these events while discussing the fact that a prophet has no honor in his hometown. Jesus was almost stoned after saying this, probably because he used examples where Israelite prophets were used as a means of blessings to Gentiles ... a truth that was not very palatable in 1st century Galilee. This and other photos of the Zarephath are included in Volume 8 of the Pictorial Library of Bible Lands and can be purchased here. More information and photos about Zarephath can be found on the BiblePlaces website here. Two Neolithic figurines were discovered at Moza (biblical Emmaus?) along the Jerusalem-Tel Aviv highway. High-res photos from the IAA are available. Two men were arrested for trying to steal bones from excavations in Beth Shemesh. The Israeli government has appealed the verdict in the case of the Jehoash Inscription, but the rationale for doing so is unclear. Shmuel Browns suggests a 10-day itinerary that will take you to many places you won’t see on a typical Christian tour. Stephen Gabriel Rosenberg provides a review of the archaeological stories in July. There is a lot to see in the Kidron Valley of Jerusalem. Accordance 10 has some nice new features for photographs and maps. Now shipping: Alexander to Constantine: Archaeology of the Land of the Bible, by Eric M. Meyers and Mark A. Chancey. Neolithic figurine from Moza. 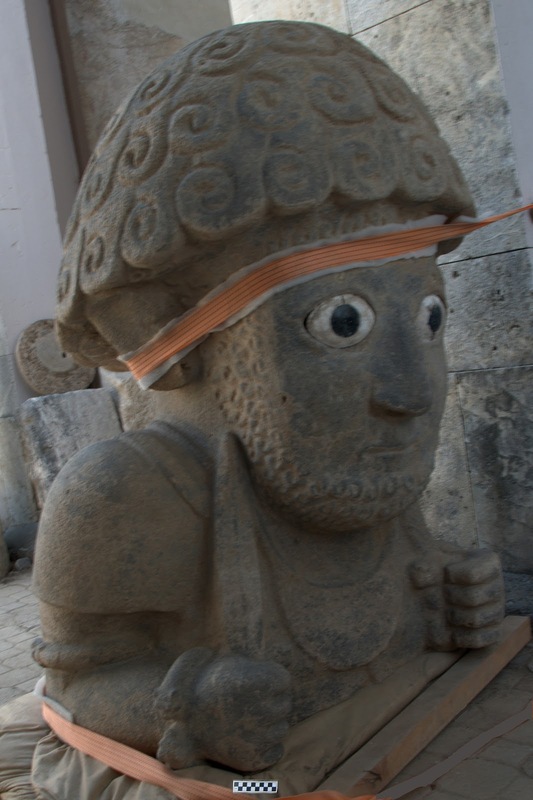 Photo by Yael Yolovitch, courtesy of the Israel Antiquities Authority. The house also provides the opportunity to clarify a difficult portion of the New Testament. How could Peter be warming himself by a fire in the courtyard on the night he denied Jesus, and yet be able to “go outside” the house of the high priest (Luke 22:54-62)? Ritmeyer explains and illustrates the concept of an open courtyard inside the palace. While I appreciate the way that Ritmeyer makes these discoveries so accessible to the average Bible reader, I am less optimistic that this particular house is the very house where Jesus stood on trial and Peter denied the Lord. In favor of making this positive identification is the fact that this is the largest house known from this time period in Jerusalem. On the other hand, most of the land in the Old City has never been excavated. If there were 100 houses in Jerusalem in the first century, how likely is it that the only complete one excavated is the same one mentioned in the Bible? See the post for the full interview, some of Ritmeyer’s famous diagrams, and links to his excellent resources. A commenter to the post also shares 63 high-resolution photos he took on a visit. These are particularly valuable because photography is not allowed unless you pay a lot of money. I appreciate the careful work that Gordon Franz has done over the past several decades in exposing shoddy scholarship by those who make sensational claims in support of the Bible’s accuracy. Ron Wyatt was the long-time leader of fraudulent archaeology until his death in 1999. One of those who picked up the baton was Robert Cornuke, a one-time policeman who now alleges to have discovered the location of Mount Sinai, the ark of the covenant, Noah’s ark, and Paul’s shipwrecked vessel on Malta. Indeed, he discovers more on a two-week summer trip than any trained archaeologist discovers in a lifetime! What accounts for his popularity among evangelical Christians? Two things: he tells them what they want to hear in the way they want to hear it. Bible believers want to hear of great discoveries that support their faith, and if you package that in a charismatic presentation or a well-written paperback, you need not bother yourself with truth. Yahweh Inscription Discovered at Mount Sinai! Was the Ark of the Covenant Taken to Ethiopia? The full list is here. You may want to bookmark this link for future reference. For critiques of other dubious “archaeology,” see Franz’s “Cracked Pot Archaeology” section. The Macherus article in the newest issue of Biblical Archaeology Review is quite good, especially with its reconstruction diagrams. A particularly impressive photo is the panoramic shot from Macherus showing Masada, Herodium, and Jerusalem. I was surprised to see the entire article available online this morning. If you don’t subscribe to the print edition, you have a brief chance to read it before it goes behind the subscription wall. An annual digital subscription to BAR is now available for $20. The level of the Sea of Galilee dropped more than two feet this summer. Carl Rasmussen has just added photos to his site of a place in Galilee I have not seen: Domus Galilaeae is a Roman Catholic retreat center overlooking the northern side of the Sea of Galilee. And his latest travel tip suggests an alternative viewpoint now that Arbel is controlled by Park Rangers and closes way too early. Wednesday marked the 200th anniversary of John Lewis Burckhardt’s visit to Petra. He was 27 when he re-discovered the Nabatean city for the western world on August 22, 1812. Gus W. Van Beek died this week. He was Curator of Old World Archaeology in the National Museum of Natural History, Smithsonian Institution and recent author of Glorious Mud! How in the world did the ancients ever move massive stones such as the trilithons in the Jupiter Temple of Baalbek that weigh more than 1,000 tons? Paleobabble answers that question with diagrams and translation from an older French article. As I’ve pointed out before in this series, pictures can be powerful tools in the hands of the Bible teacher. The right picture can illuminate a passage and bring deeper understanding. This week’s photo is another example. It comes from Volume 7 of the revised and expanded edition of the Pictorial Library of Bible Lands, which focuses on Egypt. 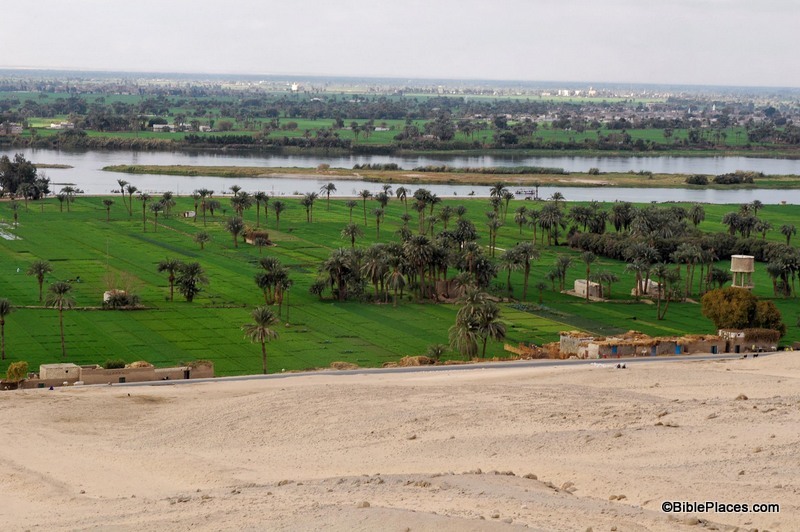 The photo is entitled "Nile River Valley Near Beni Hasan Tombs from East" (photo ID #: tb010805121). In the context of the chapter, Moses is warning the people to obey God’s commandments so that they will prosper in the land. He explains that life in the Promised Land will be very different than it was in Egypt, and this week’s photo helps explain why. 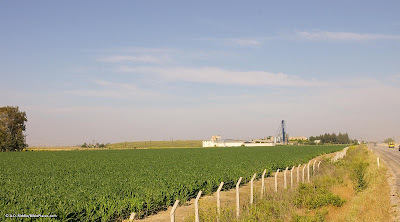 The agriculture of Egypt is based on the water from the Nile. Farmers plant their crops in the flat land around the Nile, in part, because they have easy access to water from there. The phrase in verse 10 “sow your seed and water it with your foot” has produced a number of interpretations, such as carrying the water by foot in buckets, digging channels with one’s feet, and using a mechanical device that is powered by foot. Whatever the correct interpretation, the point is that in Egypt it was possible to provide water for your crops by mere manpower. 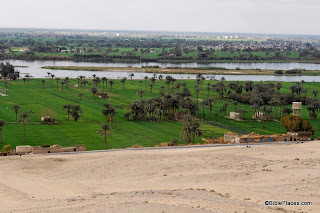 In this week’s photo, you can see the relationship between the farmland and the Nile, and it is clear from this picture that it would be a relatively easy task to get water from the Nile to the crops growing nearby. By contrast, the agriculture of Canaan is vastly different. There is no convenient and reliable natural source of water for the farmer’s crops. In contrast to the flat farmlands that surround the Nile, Canaan is “a land of hills and valleys,” which makes moving water from one place to another difficult. And the only major river that flows through the land, the Jordan, is below sea level for most of its course and is basically useless for irrigation. Before the advent of modern machinery, the only way the fields could be watered was by rain. The land to which God was leading His people was a land that required them to walk by faith and depend on Him. This and other photos of the Nile Valley are included in Volume 7 of the Pictorial Library of Bible Lands and can be purchased here. More information and photos about the Nile River can be found on the BiblePlaces website here. For more thoughts on how the Land of Israel was a land that fostered faith, see my post here. Free on Kindle today: The Apostle: The Life of Paul, by John Pollock. 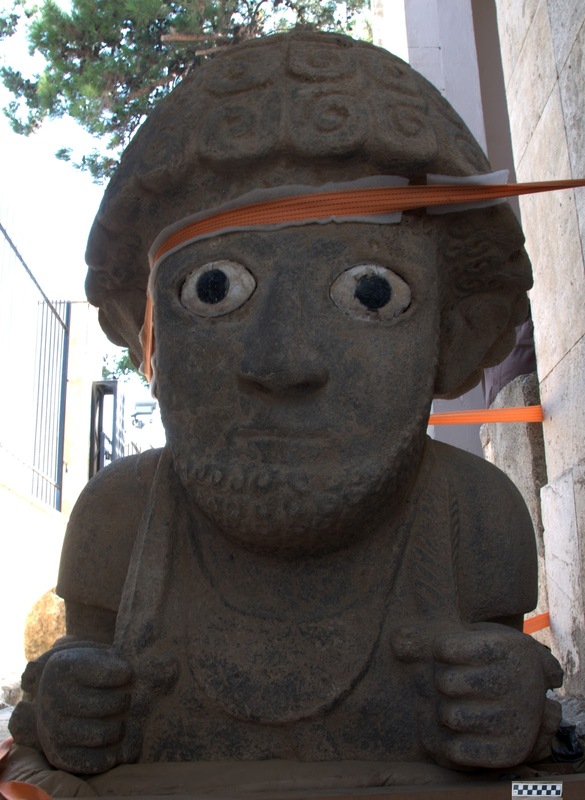 The ASOR Blog has posted the latest Archaeology Roundup. Three new volumes of the City of David final excavation reports have been published. Is skinny-dipping in the Sea of Galilee sacrilegious? The Washington Post gives my answer to the question. WiFi access is important enough to visitors in Israel that one biblical village has equipped their donkeys with WiFi routers. This article, from Jewish Ideas Daily, claims that an ancient agricultural village in Modiin Illit will be opened exclusively for the ultra-Orthodox (Haredim). In the middle of Modiin Ilit, specifically in Kiryat Sefer, there has been an ancient archaeological site dating back to the Second Temple period. The site is an ancient agricultural village, with a wine press and a synagogue that are intact. While the site from an archaeological perspective is in usually good condition, the site has sat for many years, since it was discovered, and left in disrepair. It has recently been decided, by the Iryah in coordination with the government, to clean it up and turn it into an archaeological park. The mayor of Modiin Ilit announced that as per the agreement with the government, especially because of its location being in the middle of a haredi city, which is in writing and is final, the site will be managed by the haredi community and will tell the historical narrative as per the Torah rather than science and archaeology. R' Yaakov Guterman said "the site will operate according to the narrative of our rabbonim, according to Jewish historical sources as brought in Tanakh and form the gemara and words of Chazal. The site will be open only to the haredi community, who will now have a worthy place to visit and to connect to our roots and history, without the distortions found elsewhere, where one risks hearing false opinions even to the point of apikorsus, God forbid. Also in the governmental decision it was written that the haredi community will establish the atmosphere of the site and all the details and historical mentions will be only according to sources from Chazal." The article provides some commentary on the alleged agreement. One additional point: if restricting a rather ordinary archaeological site like this one to the ultra-Orthodox community were to improve relations between the religious and archaeological groups, it might be a worthwhile “sacrifice” for the public. Update: Paleojudaica links to the story in Haaretz, along with a response by the mayor of Modiin to close the city’s central park to ultra-Orthodox. The treasure trove contains pottery vessels from the Late Canaanite Age IIB (1300-1200 BCE), which were stored in an elliptical pit of limestone rock – 3 meters high by 1.5 meters wide by 3 meters deep – containing more than 200 items, mostly previously unknown and quite rare, according to a statement from the exhibition. Inside the pit were items made locally, in Mycenae and in Cyprus. The locally-made products presumably for cult use included goblets – one with a man’s face sculpted on it – tall cylindrical stands, small stands, incense burners and chalices for libation, burning oil and incense. 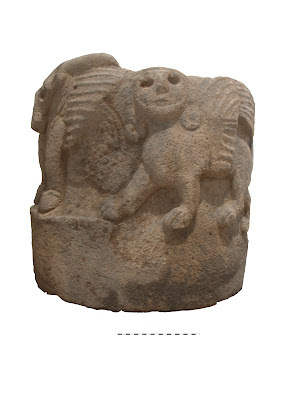 According to the exhibition, they indicate that the trove belonged to a local temple that has not yet been discovered and were items brought by worshipers. However, researchers have neither been able to identify the specific deity nor the worshipers themselves. “The pottery was either buried in haste for fear of damage by enemy forces, or stored in the pit when there was no more room elsewhere, or discarded,” the statement from the exhibition said. Among other more common local items were bowls, jugs, juglets, cooking pots, oil lamps, Canaanite jars and cup-andsaucer sets. From Cyprus, the favissa contained bowls of white-slip and base-ring wares, as well as white-shaved juglets. The full story is here. We noted the original discovery in June 2010. The IAA press release includes a few photos and six high-resolution images are available here. The original audio slideshow is still available at Discovery News. Cultic objects at time of discovery. Members of the Jezreel Expedition headed by co-directors Norma Franklin (Zinman Institute of Archaeology, University of Haifa) and Jennie Ebeling (Department of Archaeology and Art History, University of Evansville) conducted an intensive landscape survey of “greater Jezreel” in June 2012. The main goal of the inaugural season was to record surface features in a three square kilometer area to the west, north, and east of Tel Jezreel in order to identify areas for excavation in summer 2013 (Figure 1). The Jezreel team documented more than 360 features, including cisterns, cave tombs, rock-cut tombs, agricultural and industrial installations, terrace and village walls, quarries and more; most of these features had never been systematically recorded before. The results of this survey shed light on the extent of different settlements at Jezreel from late prehistory through to the 20th century CE Palestinian village of Zer’in. The article also includes an image from the recent LiDAR scan. The city of Jezreel is best known as the location of Naboth’s vineyard and Jehu’s coup. Here Jehu ordered the deaths of the kings of Israel and Judah as well as Queen Jezebel (2 Kings 9-10). In a 2008 article, co-director Franklin argued that the fortified enclosure of Jezreel was constructed not by Ahab but nearly a century later by Jeroboam II. Twenty-five years of excavations at et-Tell on the northeastern side of the Sea of Galilee are being celebrated with a fundraiser and photographic exhibition at the University of Nebraska at Omaha. In recognition of the 25th anniversary, the UNO Art Gallery will host a collection of photography from Bethsaida by Hanan Shafir. Showing in the Weber Fine Arts Building on UNO’s Dodge Street campus, the exhibition will run from Aug. 24 to Sept. 27. The gallery is free and open to the public. Hours are Monday through Thursday, 10 a.m. to 3 p.m. Groups are welcome to schedule an appointment outside of these times by calling 402.554.2796. Pre-Opening Fundraiser & Reception: Come see the place, the people, and the artifacts, meet the photographer, and listen to UNO Professor Rami Arav, lead excavator at Bethsaida. The event is Thursday, Aug. 23, from 6 to 9 p.m. All members of the public are welcome. Tickets are $40 in advance and $50 at the door. Proceeds will help faculty and students travel to Bethsaida and continue this important archeological study in coming years. Several gift items including commemorative pottery shards from Bethsaida will be raffled and Shafir’s photographs will be for sale by silent auction. For more information, see the university’s website. You will never see this picture framed in a Sunday School classroom or hanging over someone's mantelpiece, but it can go a long way in illuminating Deuteronomy 8:9 and is useful when explaining the process of ancient copper mining. Deuteronomy 8:9 states that copper could be dug "out of the hills" in the land of Canaan. Although Wadi Jariya lies within the territory of Edom and is outside the borders of the Promised Land, the process was similar there. 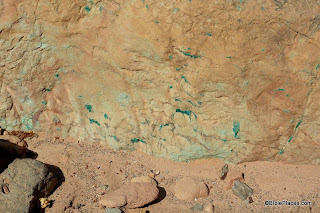 In the photo, the green specks on the rock are the copper ore. This ore was chiseled out of the rock and then refined through a smelting process which removed the impurities. When the impurities cooled, they formed a solid, dark substance called slag. At various locations in Israel and Jordan (as well as elsewhere in the Middle East) large amounts of slag are left over from antiquity. In fact at Khirbet en-Nahas, a neighboring site to the Wadi Jariya operation, a slag pile over 20 feet deep has been discovered. Copper mining was an important element of the ancient economy since copper was used extensively in that society. Usually the copper was mixed with a little bit of tin and was thus transformed into bronze, a strong metal sometimes used in scripture to refer to someone or something hard or stubborn (Deut. 28:23; Jer. 1:18; 6:28). Bronze was used to make many things in biblical times, such as utensils (Exod. 38:3), weapons (1 Sam. 17:6), chains (2 Kgs. 25:7), and cymbals (1 Chr. 15:19) to name a few. Its value is seen in the fact that it was listed among the spoils of war along with gold, silver and iron (Josh. 6:19, 24). But its humble beginnings can be traced back to this picture ... as a green speck within a hard rock found in a dry valley. This and other photos related to copper mining are included in Volume 6 of the Pictorial Library of Bible Lands and can be purchased here. More information and photos about copper mining can be found on the BiblePlaces website here. The Israel Trail has been included in National Geographic’s list of the world’s best hikes. Tourists are returning to Shiloh, and the majority are evangelical Christians. Jerusalem firefighters have battled 5,000 fires this summer, the majority of them arson. Eight new animal species have been discovered in a cave 300 feet below Ramle. If approved, a new hotel rating system in Israel should cause prices to drop. The latest in the Top 5 series at the Jerusalem Post: Jerusalem hostels. Twelve new skyscrapers will change Jerusalem’s skyline. Wayne Stiles provides a history of the Garden Tomb. A bill has been drafted which would provide separate prayer times for Jews and Muslims on the Temple Mount. Accordance has a sale on the Anchor Bible Dictionary, marked down to $200 until August 21. Source: Amihai Mazar, “The Spade and the Text: The Interaction between Archaeology and Israelite History Relating to the Tenth-Ninth Centuries BCE,” in Understanding the History of Ancient Israel, ed. H. G. M. Williamson, Proceedings of the British Academy, vol. 143 (Oxford: Oxford University Press for The British Academy, 2007), 145. If I asked my readers for the top volume on archaeology of Israel from the Old Testament period, my guess is that most would choose Amihai Mazar’s Archaeology of the Land of the Bible: 10,000–586 BCE. Those who didn’t select it would likely at least recognize the title of this best-selling work for the last two decades. I would guess that fewer readers would be familiar with the second volume in the series. Ephraim Stern’s Archaeology of the Land of the Bible, Volume II was released in 2001 and covers the years 732 to 333 BC. Though this is also a period of Old Testament history (from Hezekiah through Nehemiah), my sense is that not as many people know of or own this book. At $60, the casual reader will be turned away. Eric M. Meyers is a distinguished scholar with decades of experience in field archaeology in these periods. At just under 300 pages (excluding endnotes and indices), this work covers the essentials but will not overwhelm the reader. The book is lavishly illustrated with photos, maps, and reconstructions. I would estimate that there are more than 100 illustrations. To conclude, if you are looking for a readable and up-to-date survey of the archaeological record from about 300 BC to AD 300 written by leading scholars in the field, I would start with this one. At the moment, Amazon is listing it as a pre-order with a discount of 44% off ($40 marked down to $22.52). In my experience, prices marked down this much during pre-order increase upon release. Archaeologists have found a collection of right hands at the Hyksos capital of Avaris in Egypt. Collecting body parts was one ancient way of counting victims (cf. 1 Sam 18:25). Israeli scientists have developed a way to predict the location of sinkholes near the Dead Sea. Clay rods from the Neolithic period found years ago are not phallic symbols but were ancient matches for starting fires. A summary of the 13th season at Hippos/Susita has been released by the University of Haifa. There are more photos here. A large olive press from the 6th-8th centuries AD has been discovered in Hod HaSharon on Israel’s coastal plain. The National Project to Document Egypt’s Heritage has begun with the tombs of Beni Hasan. The Aleppo citadel has allegedly been damaged by shelling by the Syrian army. Eilat Mazar will be excavating more of the area between the Temple Mount and the City of David later this month. Nir Hasson has more on Sir Flinders Petrie, the archaeologist who lost his head. Wayne Stiles takes a closer look at Nebi Samwil and the neighboring Gibeon and concludes that they reveal similar spiritual lessons. Gordon Franz has obtained a copy of pseudo-archaeologist Robert Cornuke’s doctoral dissertation and finds that it’s a sham. Paul V. M. Flesher writes about the latest finds in the Galilean town of Huqoq. Leon Mauldin shares a photo of Mount Ararat with a rainbow. Haaretz has some tips for finding wifi in Israel. Nir Hasson of Haaretz reports on the study of ancient plants at the Philistine city of Gath. Until a few years ago most archaeologists would not even have considered these to be archaeological finds. The focus on them could symbolize the new road the discipline has taken in general, and Israeli archaeology in particular. Known as microarchaeology, this new field use precise scientific instruments to interpret more elements of the ancient record, making it more complex and at times, more human. Instead of great kings vanquishing cities, pillaging, murdering and being murdered, it also tells the story of cultural transformation and of simple urban dwellers. Called phytoliths, the white spots are what remains after most of a plant has decayed, as a kind of skeleton made of minerals. [Yotam] Asher is doing his Ph.D. on what phytoliths can teach us. Those at Tel Tzafit are what is left of plants that lived 3,300 years ago. A preliminary look under the microscope shows that one spot is what remains from a pile of domesticated wheat while another is of unidentified wild plants. "It's possible that in one place was a sack of hay and in another, a sack of wild plants, or that these are plants that were on a roof that collapsed," Asher says. The full story is here. The head archaeologist of the Gath project calls the article “great.” Joseph Lauer observes that the “four-horned altar” mentioned only had two horns. This week’s photo comes from Volume 5 of the revised and expanded edition of the Pictorial Library of Bible Lands and is entitled “Wilderness of Paran” (photo ID #: tb042007570). The Wilderness of Paran is a desert region northwest of the Gulf of Aqaba that today straddles the southern end of the State of Israel and the eastern edge of Egypt. It appears in the Biblical text as a lonely place outside the Promised Land. This region is the place where Ishmael and Hagar lived after Abraham sent them away (Gen. 21:20-21). It is also a place where David sojourned to escape from Saul (1 Sam 25:1), and a place that Hadad the Edomite passed through while he and some other Edomites were fleeing from David and Joab (1 Kgs. 11:14-19). It is apparent from these passages that this region often served as a safe haven for people who were cast out or were fleeing from danger. The Wilderness of Paran is also where Israel spent part of their time during the Wilderness Wanderings (Num. 10:12; 12:16). In fact, this is the fateful area where God’s judgment fell on the people. While they were encamped here, they sent the twelve spies into the land of Canaan and when ten of the spies brought back a bad report, the people rebelled against the Lord and refused to go into the land (Num. 13:2-3, 26). Consequently, that generation was doomed to die in the wilderness because they failed to trust in God and obey him. A photo such as this can enhance the retelling of that key chapter in Israel’s history. This photo is included in Volume 5 of the Pictorial Library of Bible Lands and can be purchased here. 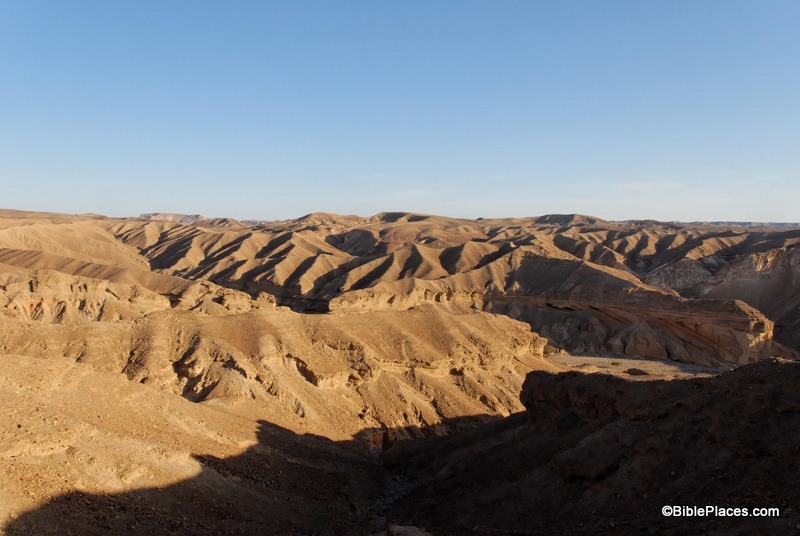 More information about the Wilderness of Paran can be found on the BiblePlaces website here. Today’s BiblePlaces Newsletter features a sale on everything we produce and a free collection of photos of Caesarea. The full story includes photos and a link to more of Micol’s discoveries. The Jerusalem Biblical Zoo and the Jerusalem Municipality announced on Sunday a NIS 80 million initiative to create Israel’s largest aquarium at the zoo. The aquarium, expected to open in 2015, will hold 2 million cubic meters of seawater in a number of large tanks. The highlight of the exhibit will be an underwater tunnel where visitors can walk underneath the aquarium and see a 180-degree view of the sharks, sea turtles, coral reefs and exotic fishes. “Jerusalem will be the first city where there will be both the Red Sea and the Mediterranean Sea, and people won’t be able to say anymore that Jerusalem doesn’t have the sea,” Mayor Nir Barkat said. With the discovery of a LMLK seal at Azekah, Omer Sergi of Tel Aviv University gave an impromptu lecture about LMLK seals. Daily updates by volunteers are posted here. Egyptian officials are trying to bring back tourists by opening new tombs, including the tomb of Meresankh. An Israeli journalist has filmed a mass grave near the Golden Gate that he suggests dates to the Roman destruction of Jerusalem. Like the tower of Pisa, the Colosseum of Rome is leaning. James Mellaart, excavator of Çatalhüyük, passed away this week. More than a hundred people gathered at the tomb of Sir Flinders Petrie this week to celebrate the 70th anniversary of his death. The latest in the wider world of archaeology is reviewed by the ASOR Blog. Congratulations to Geoff C. and Frank P., winners of Walking in the Dust of Rabbi Jesus. 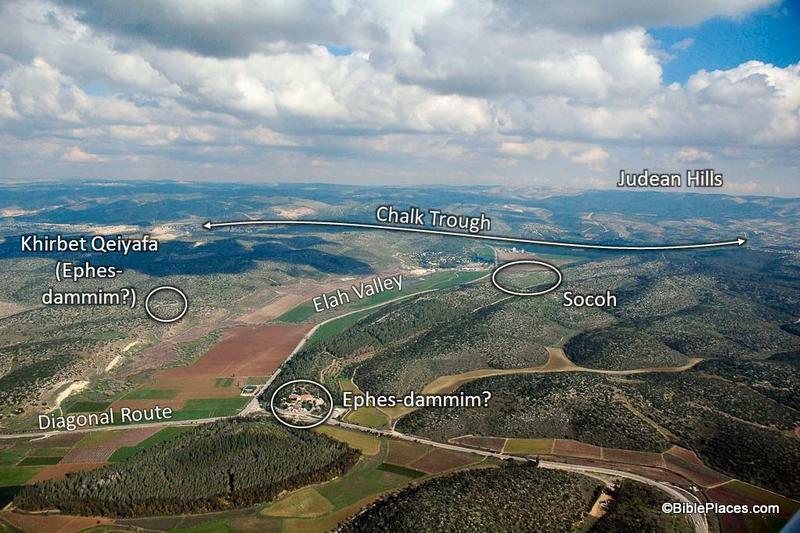 In this slide the location of the Elah Valley and Socoh are clearly marked, along with possible locations of Ephes-dammim. Azekah is not pictured here, but is located just off the photo to the left. You can easily imagine the Philistine army on one side of the valley and the Israelites on the other, just as it is described in verse 3. In the background, the Judean Hills are marked which adds to the value of this photo. When teaching on David and Goliath, I like to point out to my listeners that there was much at stake for David in this battle. Not only were the Israelite soldiers facing a deadly enemy and not only was the reputation of Israel’s God on the line, but there was another element that we tend not to think about which relates to geography. If you look at a map of this area you will see that the Elah Valley is an entryway into the Hill Country of Judah, the region where David and his family lived. Three thousand years after the fact we have the advantage of knowing how it turned out, but if David had lost the battle it is possible that the Philistines would have penetrated into the Judean Hills (as they had when they were encamped at Michmash on the Central Benjamin Plateau). This would have put David’s family and neighbors at serious risk. So as David faced Goliath, he was not only fighting for his people and his God … he also was fighting for the safety of his own hometown. This photo is included in Volume 4 of the Pictorial Library of Bible Lands and can be purchased here.